NMP has proven itself as an effective and versatile cleaning agent, removing photoresist residue while leaving the surface in good shape for processing steps downstream. However, its time may be short-lived as companies strive to meet environmental health and safety (EHS) requirements by decreasing adverse impacts of many chemical formulations used in semiconductor manufacturing. The advanced packaging space is seeing additional pressures to replace NMP. These pressures come from the use of dry film or thick spin-on resist. These resists are difficult to remove and to dissolve. 3D packaging also requires fast processing, a clean surface, and chemistries that are compatible with the materials present in bump, pillar, and redistribution layer (RDL) architectures. This article explores the associated challenges and implications. NMP is a solvent that has been widely used in semiconductor manufacturing for decades. Mainstream processes include positive photoresist stripping, developing and Metal Lift-Off (MLO). NMP displaced previous generation solvents, such as acetone, because of its chemical properties. In comparing the two solvents, NMP has a higher flash point; therefore, processes can occur below the flash point, offering a safety advantage. It also has a lower vapor pressure, leading to far lower volatile organic compound (VOC) emissions. This also permits the recycling of chemistry to >99%, even for pressurized dispenses. The photoresist saturation level is high for NMP, thus permitting a large number of wafers to be processed with recycled chemistry. Unlike some harsh solvents of the era, it is not a carcinogen. Based on these advantages NMP has become an industry standard (Table 1). Factors leading to the desire to replace NMP have come from several directions. EHS concerns have identified NMP as a reproductive hazard. This has led to a ban in the European Union (EU) for use in new processes. Established processes were given a limited term exemption, but these grandfather clauses are increasingly difficult to extend. Legislation for restricting use is proposed in the US. Aside from EHS concerns, semiconductor technology is ever changing. Corrosion from NMP on device metallization has forced the advanced packaging industry to seek alternative chemistries due to materials (such as copper) present in bump, pillar, and RDL architectures. Multi-metal stacks can suffer galvanic corrosion when deionized water is used directly to rinse NMP from patterned wafers. The galvanic corrosion can be averted with a preliminary rinse with Isopropyl alcohol, at the expense of VOC emissions and additional solvent waste being generated. NMP is hygroscopic and will pick up water from air within the fab, which affects the pH of NMP. Companies are always looking for environmentally friendlier alternatives. This can be in the form of a less hazardous chemistry or through transitioning away from the need for an isopropyl alcohol rinse to reduce VOC emissions and reduce hazardous waste volumes (Table 2). Table 2: Reasons and timing to eliminate NMP by region. NMP has been partially phased out; this is not an across-the-board phenomenon, but rather a regional trend. A review of the drivers for replacement shows evolutionary regulation has been centered on the EU. Worker exposure is a serious matter globally, however, process tool design and selection has greatly reduced exposure for fab personnel. In practice, the EHS concern has been addressed through engineering controls in tool and fab design. Real-time chemical monitoring of the air within the fab ensures exposure limits are met. There has also been a shift away from manually operated equipment and refinement in airflow with wet process tools. These refinements include increased exhaust, multiple exhaust inlets, and compartments within the tool to segregate those areas within the tool with chemistry. Accordingly, the worker exposure driver has been addressed by changing the tools performing the process, as opposed to changing the solvent itself. When process owners go into the chemistry selection process, the list for attributes is extensive and usually contains inexpensive, non-hazardous, non-volatile, high saturation point for resist loading, fast acting, residue-free, non-odorous, non-flammable, non-corrosive and long life. Ideally, the new chemical would be supplied from an established chemical manufacturer with tremendous product support and a worldwide distribution network. In practice, this chemistry, or mixture, has not been identified. There is no chemical that has all the desired attributes and accordingly there is no single replacement. The choice by process owners is to focus on a chemistry that has the critical attributes required for their process and fits within the constraints from their protocols. One widely used substitute that is compatible with existing wet process tool platforms is dimethyl sulfoxide (DMSO). DMSO is capable of stripping both positive and negative photoresist. This can be used in a pure form and is supplied by a number of chemistry suppliers. DMSO is also widely used as the main ingredient in many proprietary chemistry blends. 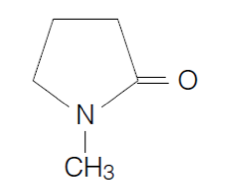 DMSO does not have the reproductive concerns of NMP. It is used by the medical industry to transport medicine through the skin and into the bloodstream. While this property is useful for medical patches, this is an area for concern for semiconductor manufacturing. DMSO alone is not as great a concern but is certainly problematic for the proprietary blends with harmful ingredients such as tetramethylammonium hydroxide (TMAH)—a commonly used base that is an autonomic nervous system toxin. Due to its transdermal properties, the issue here is that DMSO could transport these more harmful substances into the bloodstream with skin contact. EHS departments of some fabs will not, or are reluctant to, permit DMSO as an NMP substitute. This stance is not consistent, though. The aforementioned medical application for DMSO shows the benign nature of the chemical in pure form. When new processes are developed or when NMP is removed from legacy processes, it is typically not an elimination of solvent processing. Solvent processing remains entrenched in the semiconductor industry because it is a robust solution. The solution to eliminating NMP use is typically to identify another solvent that will successfully perform the resist strip or MLO process within the available toolsets. Higher end toolsets such as the Veeco PSP WaferStorm® platform can make this transition nearly transparent as the equipment is designed not only for NMP and can handle a wide variety of other solvents. Process times are usually similar to those which use NMP, so throughputs and process flows are little changed and are often enhanced, providing associated benefits to customers. At Veeco Instruments, our scientists and process engineers collaborate with many leading materials companies to compare different scenarios to determine the effect of chemistry and equipment and identify which methods provide the best process results. Industry materials providers, Veeco and process owners in turn work to qualify the NMP alternatives into production. Veeco’s experts would like to take this opportunity to identify several materials providers with whom we work closely with to offer a complete toolset, chemical and process solution for our customers. For example, EMD Performance Materials has developed AZ KWIK Strip, AZ Removers 880, 910 and 920 in this space. Technic has been successful displacing NMP with their products TechniStrip P1331 and TechniStrip Micro D2. Versum Materials has developed Dynastrip AP7880-T to be effective for the application. Veeco maintains a demo lab in Horsham, PA where candidate NMP replacement solutions are evaluated and run in an effort to develop processes and generate data. This ensures a smooth transition to the new chemistry when implemented at our customers’ sites.